Frog symbolizes creative fertility and metamorphosis. Frog is a weather worker – calling in the rains with its distinctive voice to bring cleansing, emotional release, and growth to our planet. 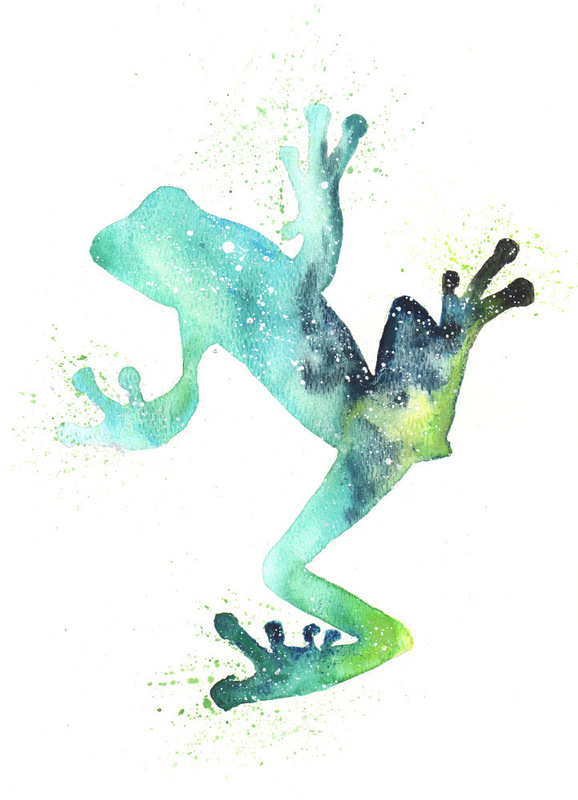 Frog asks you to work with the element of water; flow, feel, transform, and dream. Frog is creative, abundant, and fertile as life rains down around it, especially during spring and summer seasons. Swim, hop or splash! Croak, ribbit, ribbit. The vocal vibrations reverberate throughout Frog’s body and are amplified through the conductivity of water. You are sensitive to sound, music, tone, voices, song; and you wield the ability to effectively communicate your own sound to the world, being heard and causing deep shifts right down to our watery, cellular level. Frog uses water to create new life and dreams. Transformation occurs in many stages. How we start out resembles nothing of how we started and where we are going. Frog surrenders to this process, shape-shifting through egg, embryo, tadpole, breathing with gills, swimming with a tail, growing hind legs, storing food in its tail, growing front legs, disappearing tail, learning to hop, and going from only living in the water to now also living on land. Frog will go on to create more tadpoles (or creative manifestations) and meet with death. This is a tremendous metamorphosis. Look to Frog for inspiration on how to accept the changes that want to happen in your life. Beyond physical transformation, remember that ideas, dreams, and visions go through this same process. Let them morph into the highest version they can be (which most likely won’t look like what you envisioned when you started out). Be flexible with how you need to move through the world at different times. There are many varieties of Frogs. Try to identify which one is calling to you and study their particular traits. Rabbit & Honey Bee for more creative fertility. Dragonfly, Butterfly, and Pheonix for metamorphosis. I want to hear about your Frog experiences. What stories or dreams have you had? Please share and join in the conversation below!